Looking for a mellow and relaxing experience? 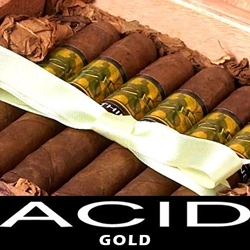 Try one of these great styles of Acid Gold Holistic Premium Cigars. Bundled up in a Connecticut Shade wrapper, enriched with Nicaraguan fillers, each of these hand-rolled premium cigars gives an offering of a sweet and spicy taste to every note that burns slow with a rich and smooth aroma. Smokers Discounts offers Acid premium cigars in numerous varieties of sizes and flavors. Check out all the styles available here for a discount price! Call us for more details!